If you want to remove EC2 instance backups from external repositories, you can use the Delete from disk operation. 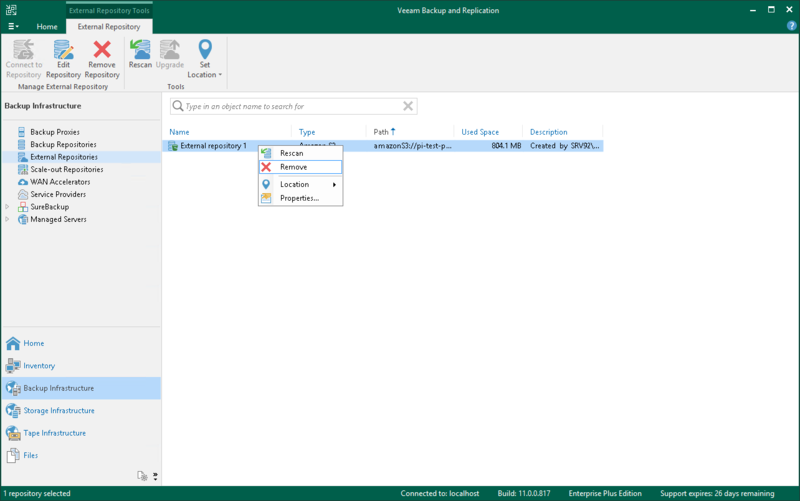 Data will be removed from the Veeam Backup & Replication console, configuration database and associated Amazon S3 object storage repository. Data cannot be removed if the maintenance job is in progress. Data cannot be removed if at least one restore session of external repository data is in progress. Ownership is not required to remove data from external repositories. In the inventory pane, expand the Backups node and click External. In the working area, select a backup or a separate EC2 instance in the backup and click Remove from > Disk on the ribbon. Alternatively, you can right-click a backup or an EC2 instance and select Delete from disk.